It’s been 3 months since I last wrote. 3 months since Patrick’s one-year transplant anniversary. 3 very busy, full and blessed months. And I have kept meaning to write but it was all just going by so quickly, so busily, so trying-to-keep-us-moving-forwardly that I haven’t. Since I’m catching you up, this could be a long one. This time last year, Patrick was finally showing improvements after a very terrifying battle with “the stomach flu,” also known as norovirus.. something I will never take for granted again. And I wasn’t telling any of you, but the doctors in their morning rounds were talking about how, if Patrick was able to start to tolerate feeds again, they didn’t have any transplant-related reasons for keeping him in Nebraska. We didn’t believe them. We didn’t even dare hope it. And yet, two weeks later on Valentine’s weekend, they sent us home. In the three and a half months between Halloween and Valentine’s Day, Patrick made such amazing strides. He proved to us that miracles do happen. And this year, he has done it again. He has come SO far in the past 3 and a half months. November was challenging. We had a wonderful birthday trip to Disneyland that I have great intentions of sharing with you later. We started out sentimental about transplant. But honestly, after about half a day of the celebration we were ready to start celebrating not where we’d been but where we were going. And so, celebrating his birthday was extra sweet and the beginning of some amazing new things. One of Patrick’s favorite activities.. tracing letters. Best done hanging off of something. When we left on the trip, Patrick was struggling with the transition to school and with potty training especially. I was spending my afternoons at the school trying to find a way to help him through his anxiety. That was a theme of November. Visiting the school and trying to help him to not be afraid and to mediate a peace between him and his aide as they were locked in a battle of wills over the issue. And then, like that, he succeeded. And we threw a bit of a party for him. We literally danced right then and there. And then another day I was late and when I got there, he didn’t need me after all and I snuck away without him knowing I’d come. And slowly I was able to slip away. However, with that battle of wills over, Patrick shifted his battle to be more directed at his aide. We started to have big behavioral problems with him at school. One morning, Patrick was avoiding getting ready for school and then he broke down and he cried. He crawled up in my lap and he told me how discourage he was there. And I didn’t know how to help him and I cried, too. And after two miserable weeks, Patrick’s monthly bloodwork revealed that his Prograf levels were sky high. No wonder he wasn’t happy! He was always grumpy and angry and uncooperative when his levels were so high. So we adjusted the dose and the next day he was back to himself again. And I did some research and some talking to doctors and some praying and realized that when we’d discontinued Patrick’s tube feeds at the beginning of November, he’d started to take his evening meds on an empty stomach. It was a big ah-hah! So at an appointment with his GI, where we already were talking about how to push more calories because he was starting to lose weight, we decided to give Patrick a glass of Carnation Instant Breakfast, a.k.a. “chocolate milk” at bedtime. And his levels came back down and you could tell he was feeling better. The idea at first was to give protein shakes by g-tube. 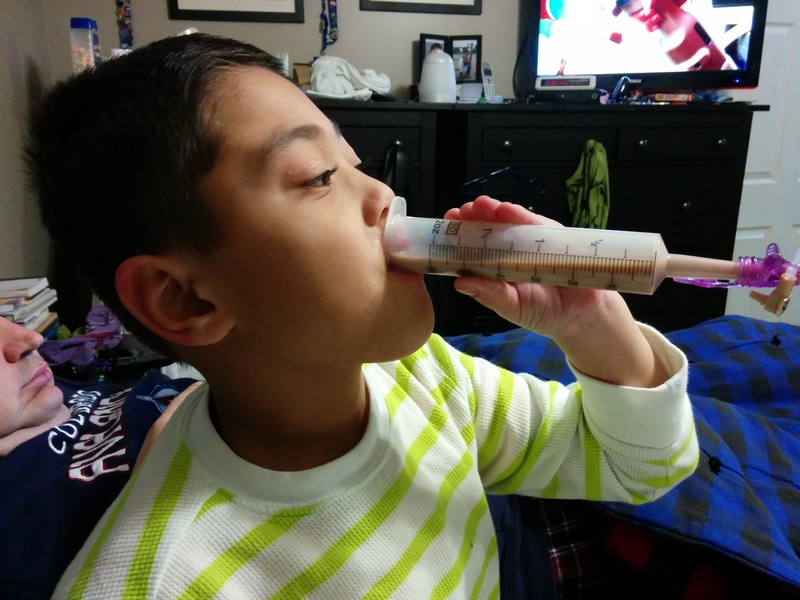 Problems is, Patrick thinks it’s super fun to drink from a syringe. So most “boluses” end up given like this. Well, except that he had gotten into a habit of butting heads with his aide. I started having the teacher send home reports of Patrick’s behavior each day. With meds right, most days were better. But we still had some iffy days. And I started bribing Patrick with vanilla tootsie rolls to stay out of trouble at school. I don’t know if that was why. She doesn’t say it was. But at Christmas break, Patrick’s aide quit and a new aide was hired. The new girl working with Patrick is young, but has a gentler touch and they seem to be getting along. Patrick has gotten a tootsie roll every day since she started. And since they have no potty training history, that problem is a distant memory. In fact, we’ve shifted from regular accidents to waiting to let Patrick go to the bathroom. We were terrified that dairy was going to be bad for Patrick’s gut. It can be for other intestinal transplant patients. We were really told he’d never be allowed milk. But instead, since adding cheese (Patrick’s absolute favorite food to the exclusion of all other foods), Patrick’s gut has adapted better than we ever imagined. It’s been a little bit of a difficult transition for Patrick. To go from chronic diarrhea to not. To have his belly feel full in the mornings. He wasn’t much of a breakfast eater before. But now some days it takes a lot of coaxing and imagination and bribery to get him to eat and allow his belly to wake up in the morning. He still does not love going to the potty. And we are often late in the morning as a result. Dairy allowed and pushing calories? …Leatherby’s ice cream it is. The biggest problem with this new problem is that it isn’t good for Patrick to refuse to eat. He has lost weight constantly since tube feeds were stopped. At first, it was a lot. He lost very quickly. We’ve been adding calories everywhere we can. Extra butter. Lots of cheese. (Lots, and lots…like 10-servings-a-day-lots). Switching to whole milk which is offered with every meal and also at bedtime. Allowing him to snack from the moment he comes home until an hour before dinner and then to snack again till bedtime, when I offer a “second dinner” if he wants it. I’ve tried “bolusing” extra calories when he refuses to eat. That means, using a syringe and gravity to give milk through the g-tube. But some days his belly is so full that it literally won’t flow in. Some of the problem is oral aversion. With so many hours a day at school, I can’t really afford using dinners too much to teach Patrick to eat new foods and his repertoire of safe, familiar foods is very limited. But some of the problem is just anatomy. I’m not sure we can afford to fit many more calories into his waking hours. If he doesn’t at least maintain his weight this month, we may have to go back to some tube feeding. But that is the medical news. It’s what is turning my hairs grey and giving me wrinkles. But it’s only part of the story. But after a couple of weeks, he fell. It took a couple of times that he was terrified and refusing to ride before we realized that one training wheel was slightly loose and he didn’t feel as steady. So daddy tightened up the training wheel and we told him that he just needed his helmet and he’d feel brave again. That helmet is working like Dumbo’s feather. With it, though he’s not quite as fearless as he was at first, he’s back to flying around the neighborhood everytime the sidewalks are clear enough. Another big thing that happened in December is that we got Patrick into a psychiatrist. Patrick’s been seeing a psychologist for a few years now. But a psychologist can’t write prescriptions. So, after much discussion and after seeing that Patrick was becoming medically stable enough, we decided it was time to try medication for his ADHD again. Stimulants like ritalin still aren’t an option. Not with their major side effect being appetite suppression. But his doctor suggested a drug called “Clonidine” for impulse control. It’s also used to treat high blood pressure, drug withdrawal, and anxiety. And the transplant team felt that it was an absolutely safe choice to start with. So Patrick’s therapist called a colleague and told him exactly what she wanted him to prescribe. 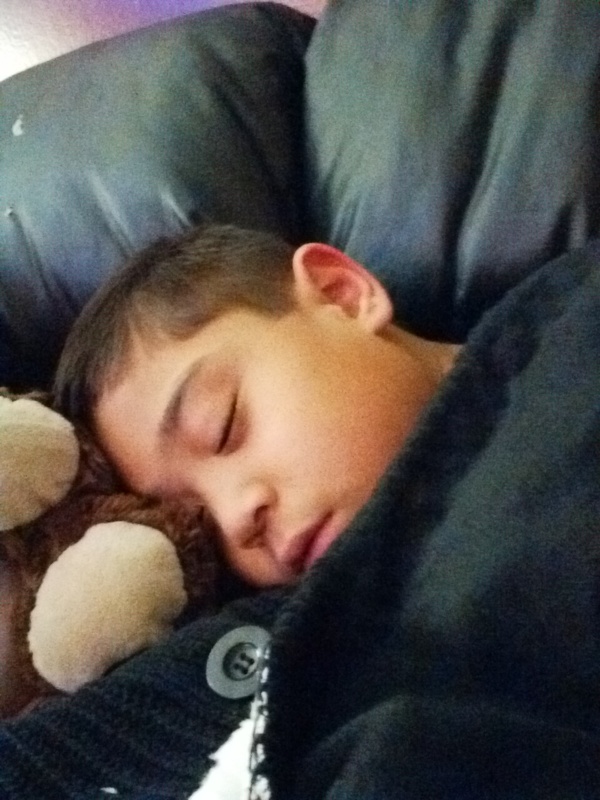 In December we started giving Patrick a “crumb” of clonidine before and after school. The change was profound. He started to be able to sit through some of church. He started to be able to stay focused on a game or toy that interested him. He calmed down at school. He didn’t have to be reminded to pay attention to his homework. The difference was night and day. Of course, it also decreased his blood pressure which made him so tired that he started to fall asleep by 6 p.m. So we had to adjust dosing times a little bit. Now he takes one quarter pill in the morning when he’s well-rested and it carries him through the school day. When I pick him up, he’s starting to get a bit “bouncy” and we let him stay that way. Afternoons are free play time in our house now so that he doesn’t get in trouble for the extra trouble with impulse control as easily. And then at dinner, he takes his second pill. 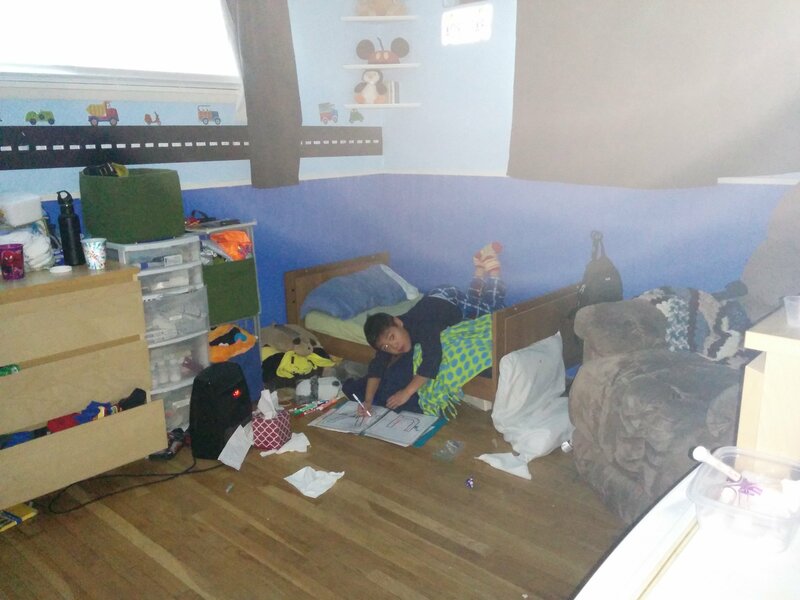 It makes it so he can get through his homework in half an hour instead of 1 or 2 hours or more. And then he starts to get sleepy just on time for bed. And as long as he takes a nap to catch up on sleep on Saturday, this mostly work ok. Feeling calmer, Patrick’s finally able to get back into more of the kid things that he has loved to do but couldn’t stick with before. … you might as well take the afternoon off and have a field trip to the zoo. We had it all to ourselves. Our church schedule changed from 11 a.m. – 2 p.m. to 9 a.m. to noon. Since this is his very best time of day, and because he’s not distracted by being hungry, he’s able to go to his primary (children’s sunday school) class with an adult helper. (Who is amazing for him.) And then instead of hanging out at the back of the room oblivious to what is going on, he’s sitting with his class and much more engaged in learning. They gave a challenge to the kids to memorize a verse of scripture last month. So I put a key portion of it on a piece of paper and he read it every day until he could recite it by memory. Then last week, he stood up and recited it in front of the other kids. He was SO proud of himself! His reading is coming along. So is math. They’ve been teaching him how to use touch math for addition and he’s catching on and starting to believe me when I tell him, “You can be really good at math.” His writing is improving enough that he is handwriting most of his assignments. This can still be frustrating for him sometimes. And he still has a ways to go. But it’s getting better. …and then did the assembly on these delicious pizza roll-ups and pasta salad! With his focus so much better, though, I can see how much memory still gets in his way. He really truly just forgets things. Especially names. PLEASE BE KIND if he asks you your name, even though he’s known you for his entire life and should be able to remember it. I’m beginning to believe that this is a trait of his brain injury. He still misses numbers when he’s counting. He still gets stumped on words I know he knows when he’s reading. And I think it’s a problem with recall that he can’t help. That makes it all the more amazing that he’s succeeding at memorizing scripture. We’ve picked two more to work on this month. There are some very amazing and specific promises related to scripture study. Especially study of the Book of Mormon. And I have seen that EVERY time that we have used scripture to help Patrick work on a goal that we believe might be impossible because of his injury, I have seen him meet and exceed those goals. Those promises from the Lord are real and can work miracles. Anyway – I have a lot more to catch you up on. And we have a lot of new milestones ahead of us this month. And so I’m going to end this lengthy post here for now with the hope that I’ll be able to fill in more later. We are grateful to those of you who have helped us through these last few months. It is not easy to learn to eat, potty, read, write, add, attend school, attend church, make friends, control your temper, and pay attention all at once. I know I couldn’t teach it all myself. So thanks to those who’ve been there to help. And to listen and offer counsel when I’ve been discouraged. Thanks to transplant, we have a lot of living and learning ahead of us. More than we hoped could be possible. And this has been a big growing season for us as we’ve come to realize that there is a path that lies ahead, and we have begun to try to learn to navigate it. This parenthood thing.. it’s a lot harder than I ever imagined. It’s forcing me to become a better person than I knew I needed to become. This entry was posted in ADHD, Adventures, Brain Injury, Development, Life as an SBS mom, Medical updates, Parenthood, School, Transplant and tagged ADHD, ADHD medication, behavior, eating after intestinal transplant, enteral feeding, food allergies, intestinal transplant, LDS Primary, learning to eat, learning to read, outgrowing food allergies, potty training after intestinal transplant, prograf, recovery, school, scriptures, the Book of Mormon, transplant medications, transplant recovery, trials and triumphs on February 2, 2016 by geekino.